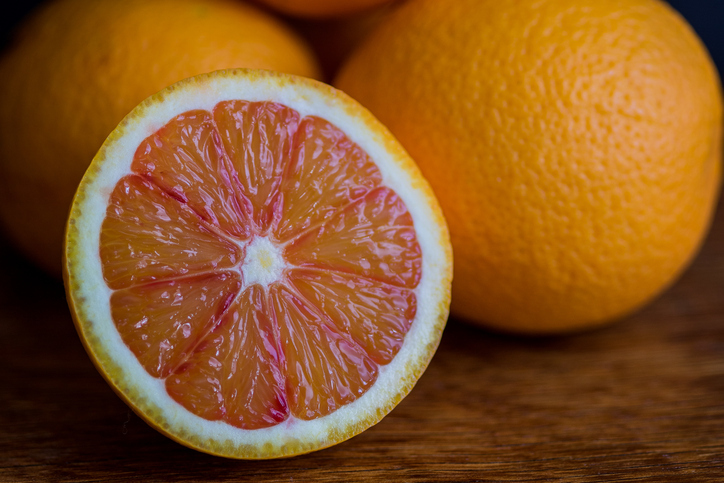 Pith is the soft, white substance found inside the rinds of some fruits, especially citrus fruits. Pith is also the soft, spongy tissue in found in the stems of plants or in the trunks of trees and, if we are talking about animals, it is the soft inner part of a feather or hair. Figuratively, the pith is the important or essential part of something. It can also mean ‘weight or substance’ or ‘strength or vigor.’ As a verb, to pith means ‘to remove the pith from plants or fruits’ or ‘to destroy the spinal cord or brain’ of animals. Cut long strips of zest from the rind of the lemon, being careful not to get any of the pith. The botanist cut open the stalk to see the pith. Carl removed the pith from the stalk of the feather. After listening to the speaker drone on for an hour, the audience wondered if he would ever get to the pith of the matter. Looking at what the villagers achieved, it's clear they had pith. Peel and pith the fruit, then slice it finely. The slaughterhouse workers pithed the cattle. The related adjective pithy means ‘brief, forceful, and to the point.’ So you might hear a writer’s style or a comedian’s wit described as pithy, for example. Pith dates back to before the year 900. The Old and Middle English noun piþa (pitha) originally meant ‘the inside of plants’ as well as, figuratively, ‘the essential part’ of something. It came into English from a West Germanic language, and can be traced back to pithan-, a Kow Germanic root, though its origin before then is uncertain. It is related to the Middle Dutch pitte, the Dutch pit and the East Frisian pit (all meaning ‘hard seed’), as well as the English word pit, meaning ‘hard seed,’ though this noun actually came into English later, through the Middle Dutch. The figurative senses have been used since Middle English, and the meaning extended to the inner part of a feather or hair. The verb comes from the noun, and dates back to the early 19th century. It originally meant ‘to kill an animal by piercing the spinal cord,’ and soon extended to ‘removing the pith’ (from fruits, trees or feathers).